This is kinda old news by now, but if you still haven't heard, the wrestler turned actor Dwayne "The Rock" Johnson has been given the role of Black Adam in the upcoming Shazam movie. I have to be honest, I'm questioning if that was a good move to cast him for the part. Don't get me wrong, he seems like a nice enough guy and all, but he isn't the greatest actor the world has ever seen. Well, enough with my personal views on the matter, let's get into some details about this comic. First and foremost, this issue of Marvel Family has the first appearance of Black Adam. Long before DC Comics obtained the rights to the character, Fawcett Publications created Black Adam as a one off villain to go up against Captain Marvel and the rest of the Marvel Family. There is also a very brief origin of the character in this issue. It seems that Black Adam was born in Egypt about 5,000 years ago and went by the name Teth-Adam. He was summoned by the wizard Shazam and given incredible super human powers, and declared him now be called Mighty Adam. Shazam was expecting him to fight the evils of the world, but Mighty Adam soon became power hungry and wanted to take over the world with the help of his new powers. Shazam was not pleased with his creation and banished Mighty Adam to the farthest star in the universe, but not before renaming him Black Adam. Adam vowed that he would return to Earth to seek revenge on the man that had banished him. It took him 5,000 years to do it, but he finally reached Earth only to find that Shazam was no longer alive. Let's move on to the origin of Captain Marvel. A young orphan, Billy Batson, was summoned by Shazam, the same wizard that created the evil Black Adam. Knowing that he wasn't long for this world, Shazam summoned Billy to him, and transferred his powers to the young lad. Once Billy said the name of the old wizard, a quick flash of lightening and clap of thunder later, Billy was transformed into Captain Marvel. Shazam died immediately following this when a chunk of stone collapsed onto him, but his spirit arose from the debris to help guide the new superhero. This comic also briefly tell of how Freddie Freeman became Captain Marvel Jr.. Apparently Freddie was severley injured and crippled in a accident. Captain Marvel takes the injured teen to the spirit of Shazam to see if he can be saved. Shazam tells the Captain that the only way to save Freddie is for Captain Marvel to give some of his power to poor Fred. After Freeman says the name of Captain Marvel, a quick flash of lightening and clap of thunder later, Freddie Freeman is now Captain Marvel Jr.
Mary Marvel is actually Mary Batson, Billy's long lost sister. She is able to become Mary Marvel simply because she is the sister of Captain Marvel. She says the name "Shazam" and a quick flash of lightening and clap of thunder later, she becomes Mary Marvel. There is a fourth member of the Marvel Family. This character would be Uncle Marvel. He is somewhat of a fraud superhero. He has no powers, but when one of the other Marvel's turn into their alter ego, he quickly changes into his Uncle Marvel costume. I guess that should be his super power. Being able to change clothes in the time it takes for lightening to strike. So, after Black Adam finds his way back to Earth, he meets Captain Marvel and Captain Marvel Jr. They duke it out, blow for blow, but none of the punches do any damage. It kind of reminded me of the battle between Superman and General Zod in the Man of Steel movie, but without all of the collateral damage. Anyway Black Adam escapes. For some inexplicable reason, the two Marvels change back into Billy and Freddie and go to see the spirit of Shazam. When they get there, they are gagged and bound by Adam, and helpless to save themselves. In comes Mary and Uncle Marvel to save the day. Shazam tell Uncle Marvel that the only way to defeat Black Adam is to trick him into saying the wizards name. Well, he is tricked and say the magic word and turns back into the mortal Teth-Adam. Due to his age, his body immediately start to wither and decay... well that's the short story anyway. Obviously, the character doesn't stay dead, like most comic characters, and is resurected by DC Comics in Shazam #28. I'll get more into that comic in the near future, so stay tuned. As I expected, there aren't many copies of this book that have already been graded by CGC. As of this writing there are only 78 listed on their census, and most of them are low to mid grade copies. You see, this comic came out in a time when most kids went in and bought copies of their favorite titles, read them to hell, and eventually they got tossed in the trash. Those that didn't go into the trash were left in pretty bad condition. There are a few nice high grade copies, but not many. The highest graded copy listed on the census is a very respectable Universal 9.4 NM. If you're able to find this copy for sale, don't expect it to be cheap. The Overstreet Price Guide has 9.2 NM- valued at $7,000, so you can expect and already graded 9.4 NM to go for at least a few thousand dollars higher. While I'm talking about Overstreet, values listed in the price guide for this comic have gone up a lot over the past two years. 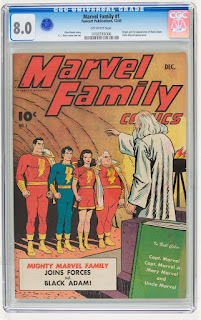 A 9.2 copy of Marvel Family #1 was only valued at $2,800 in the 44th edition of the price guide. That is a huge jump in a very short amount of time. Instead of looking at "guide" prices, let's take a look at some actual sales prices over the last few years. It wasn't that long ago that you could snag a nice copy of this comic for a very reasonable price. 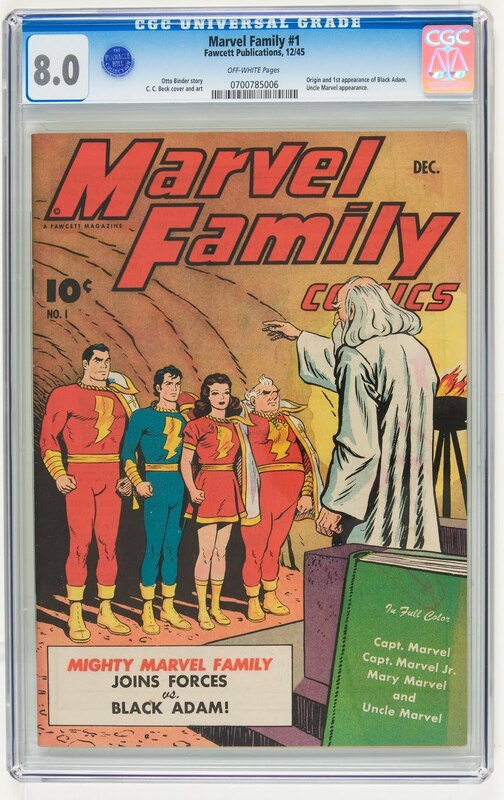 Back in 2010, a very nice CGC 8.0 VF copy sold at Heritage Auctions for only $657.25. That's no longer the case. Fast forward to now and prices are much different. The last sale on eBay for a 5.0 VG/F copy ended up dropping at $2,500. That's a long way from where it was six years ago. If you were lucky enough to have a copy of this comic in your collection before the hype started to hit and more people knew about this comic, then you will probably make out like a bandit. Now might be the time to throw it back out on the market. I'm not sure how much more room there is for any growth on this comic. It's definitely at a peak now, and how high the next peak will be remains to be seen.